A kind hearted orphaned high school student who, at the start of the story, begins living in a tent. She is then found by Shigure and Yuki, who offer to take her in in exchange for housekeeping. She loves to cook and describes herself as an excellent housekeeper. She also has an after-school job as a janitor to pay her tuition fees to avoid being a burden on her grandfather. 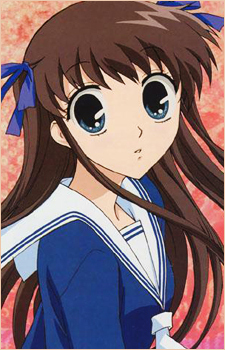 She is depicted as polite, optimistic, extremely kind, and selfless; several other characters, including Kyou, Rin and Hanajima, tell her she needs to look out for her own interests and not shoulder everyone else's burdens. Tooru habitually speaks formally (see Honorific speech in Japanese), but not always correctly, a habit she picked up from her father, Katsuya, after he died when she was three, as a way of replacing him in her mother's eyes. Tooru's mother, Kyoko, raised her alone until she died in a car accident shortly after Tooru entered high school, a few months before the start of the story. Tooru repeatedly calls Kyoko the most important person in her life and treasures her photograph; when she falls in love with Kyou she feels guilty of being "unfaithful" to her mother's memory. In the first half of the series, as Tooru learns about the zodiac curse and its effects on those she loves, she becomes distressed, and when she learns that the dangerous Akito is the "god" of the zodiac, she resolves to break the curse. Only later does she admit that she wants to free Kyou most of all. Despite setbacks, she stubbornly persists in her goal and eventually frees Kyou and her friends. In the last chapter, she begins moving with Kyou to another city so he can continue his martial arts training, and in the final pages they are shown as a loving elderly couple with a granddaughter. Note: "Tooru Honda" is the correct spelling of this name per Hepburn romanization, which is used as a MyAnimeList standard. Please do not submit changes for the name.